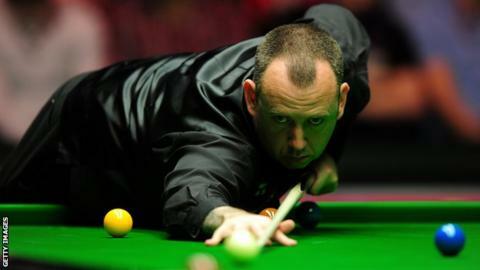 Mark Williams has played down his chances of winning the World Snooker Championship for a third time. Williams lifted the crown in 2000 and 2003, but does not think he is a realistic 2016 contender. "It would be unbelievable if that happened. I'm a definite outsider," said Williams. "Let's just see if I can get my form going. It's definitely there - I've been bringing it out here and there in matches." However, as well as believing he has played "some really good stuff", Williams admitted: "I've been playing some poor stuff as well." The 41-year-old from Cwm near Ebbw Vale has only gone beyond the quarter-finals once since 2006, reaching the semi-finals in 2011. He is determined to improve on his 2015 performance when he lost 10-2 in the first round against fellow Welshman Matthew Stevens. "Hopefully I'll play a lot better than I did last year because I was appalling," said Williams. "That's probably one of my worst performances as a professional." Williams' self-assessment is a stark contrast to compatriot Michael White who classifies himself as a "dangerous outsider". "O'Sullivan is the player to beat even if he's not at his best," said Williams. "He is so far in front of any player in the world at the moment, it's hard to describe how much better he is than everybody. "Neil Robertson, Judd Trump, Mark Selby - they're not in the same league as O'Sullivan. "He's 40 and he's not the player he was a few years ago, but he's still different class to everyone and I think every single player knows it". Williams will start his opening round match against 2006 world champion Scotland's Graeme Dott at 19:00 BST on Sunday. The match will be played to a conclusion on Monday afternoon.